Welcome to Surfin G Ranch, located in Bayview, Texas only 15 miles from the beautiful beaches of South Padre Island. 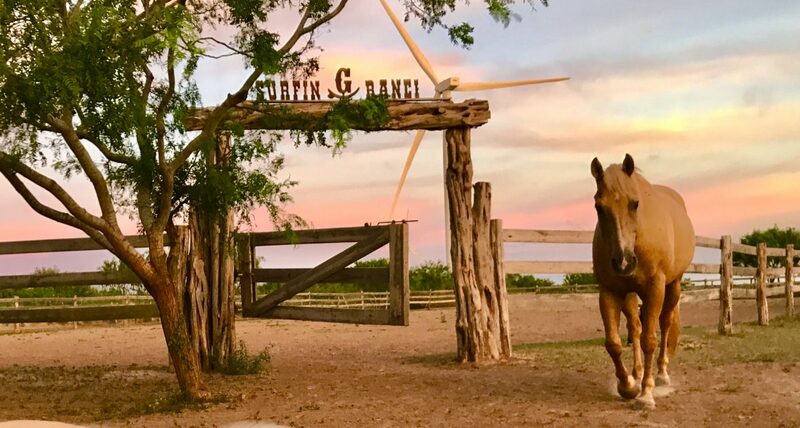 With a tropical yet rustic setting, the Surfin G Ranch is available to book for your birthday party or other private event. The ranch features 10 fenced acres of open pasture land, a covered deck with barbecue pit and picnic table, a small cabin, and a riding arena. If you are an equestrian that has always dreamed of riding on the beach and are in need of overnight boarding for your horse, we have two options available for you that would include a loafing shed and water trough, as well as use of our training facilities such as the round pen, arena, and obstacles. Situated in farm land that borders the Laguna Atascosa Wildlife Refuge, we have fantastic trail riding just out our back gate as well. Horseback Riding Lessons and Horse Training are also available. Our horse had a mini vacation at the Surfin G Ranch over Thanksgiving. She had a great time on the ranch and the Gore’s are the best horse hosts around! The Surfin G provided a separate, roomy pen with access to a back pasture for roaming. Resident horses and one friendly donkey provided lots of social fun for our girl. Thank you, Surfin G! The Surfin G Ranch family are amazing! The Gores made my six year old’s dreams come true by transforming their beautiful horses into majestic unicorns! The entire party, including adults enjoyed a dreamland adventure with the horses while the Gores made sure safety was a priority. Till this day, our family and friends can’t forget the party of the “century”. Surfin G Ranch definitely knew how to bring out the child in all of us! We are forever grateful for the experience and can’t wait to book another party! The Gores have also always helped us with horse training, problems and advice.